Where’s Steven and What’s He Grilling? 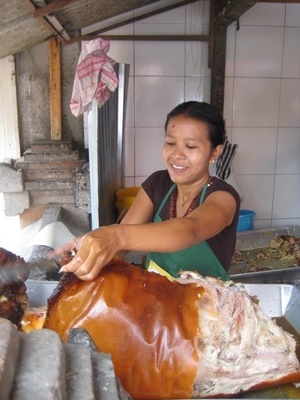 It’s the most famous roast pig in Indonesia–Balinese babi guling. 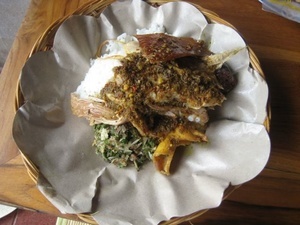 And the best place to try it is at the legendary grill parlor, Ibu Oka, in the artist town of Ubud in central Bali. Here Steven takes his turn rotating the spit. 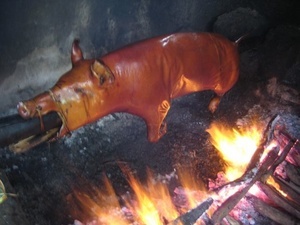 The pigs are marinated in a fragrant paste of garlic, chilies, ginger, lemongrass, galangal, turmeric, and other spices and spit-roasted next to a wood fire. 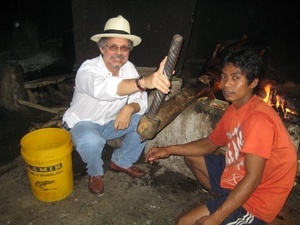 Each roast pig is carved to order. When eating Balinese roast pig, be sure your serving includes a few shards of crisp skin along with the succulent, spice-scented meat. 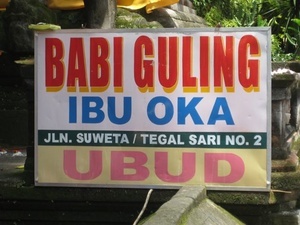 Ibu Oka is located in heart of Ubud on Jalan Suweta. Don’t miss it!